A bath bomb can make bath time lots of fun. Dropping bath bombs into the tub creates fizz in the water as well as bubbles. It explodes into different colors, making everything more interesting. They often also have moisturizing and soothing properties. Unlike your regular bubble bath liquid, this makes everything more relaxing and fun at the same time. 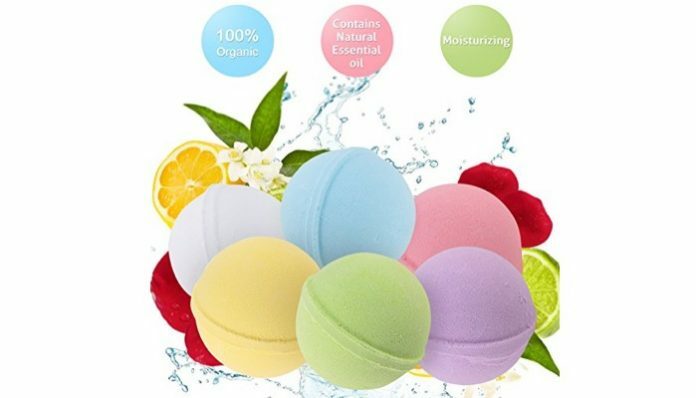 If you’re curious, you’d be glad to know that bath bombs have special ingredients or what they call bubble mix to make the colorful pigments and popping effects. Here is a great sample on how it’s made from start to finish. For days when you have to hurry and would rather spend a few minutes in the shower, here is a guide on the best body wash that you might find interesting. But there are various kinds of bath bombs out there. How do you pick the best one? Our list will show you your best choices according to your budget and preferences. 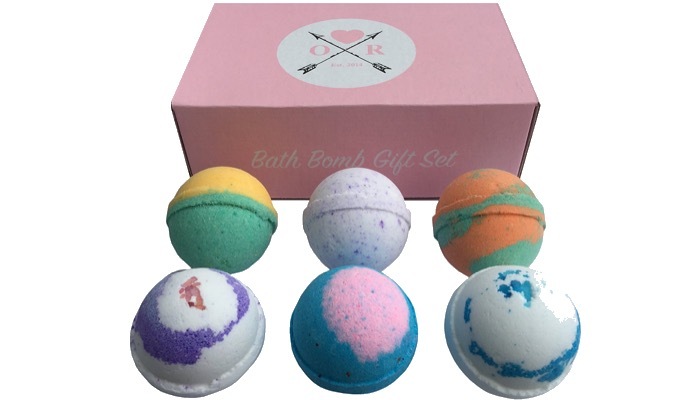 The best choice for us is the Rejuvelle Bath Bomb Gift Set USA. These are handmade products that are vegan and all natural. It has no toxic fragrances. It has organic ingredients and essential oils. They’re fragrant and would leave your skin soft and full of moisture. When you pop one into the water, it will explode into a swirling, twirling ball of fragrant and moisturizing fizz. One regular bath bomb is about the size of a golf ball. These bath bombs do not have colors so they will not tint your bathtub or skin. They have organic sunflower oil, cocoa butter, and organic Shea butter. 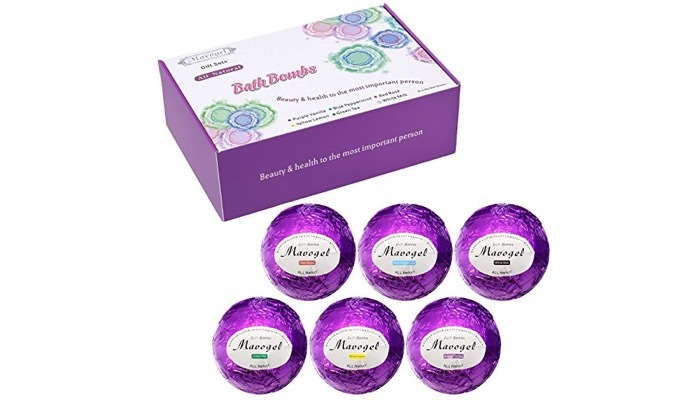 Our next best choice is the Oliver Rocket 6 Piece Aromatherapy Bath Bombs Set. They’re a mixture of fizzy, fragrant and soothing scents that will help create a relaxing bath time experience. They are handmade in the USA and use only vegan and gluten free ingredients. It has 6 different scents. You can choose from lavender, cucumber melon, grapefruit tangerine, black raspberry vanilla, and cool water. Once you drop the bath bombs into the water, they will create a luxurious spa-like experience. They come in beautiful pastel colors and can be perfect as a gift. 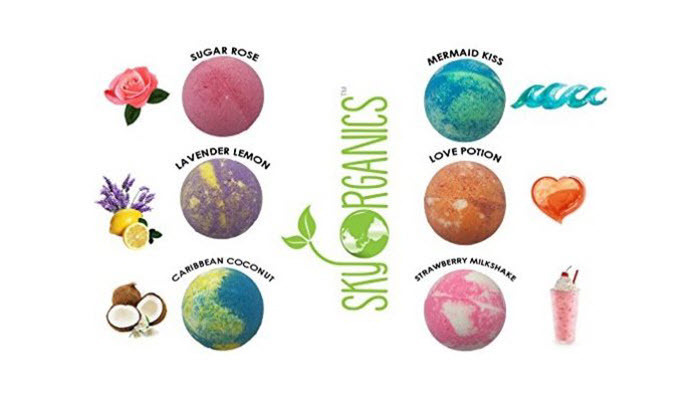 If you’re very particular about using only organic ingredients, the Sky Organics Bath Bombs Gift Set is perfect for you. These create serious bath time fun. They come with organic essential oils and organic coconut oils. These offer a relaxing, invigorating multilayered explosion and scent. The scents include Caribbean coconut, lavender lemon muffin, love potion, mermaid kiss, strawberry milkshake, and sugar rose. Your skin will be hydrated and moisturized after bathing. You will also feel relaxed and renewed. These bath bombs are the size of a tennis ball. They’re nicely packaged and are perfect as gifts. 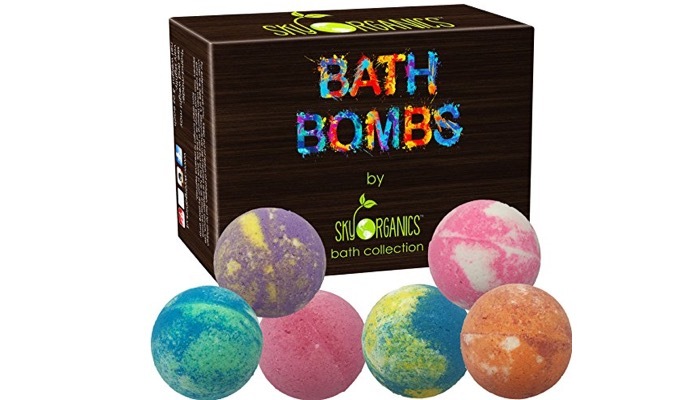 Another great option is the LifeAround2Angels 12 Bath Bombs Gift Set. 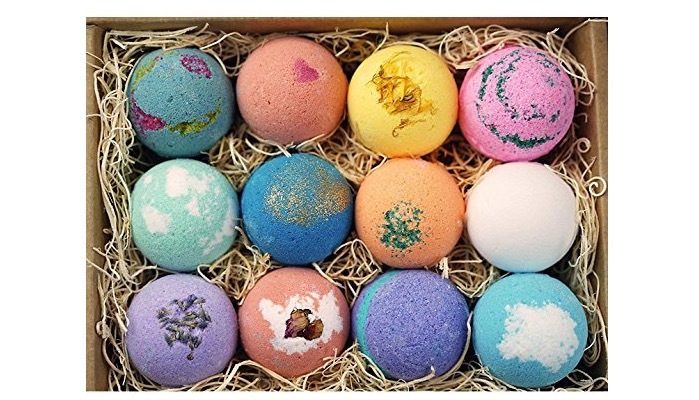 They uniquely handcrafted these bath bombs that are both functional and relaxing. They are therapeutic and relaxing, and they’re great for normal to dry skin. These have a balanced lightweight moisturizer to keep your skin hydrated but will not leave you feeling sticky. The set includes twelve scents that you can use for different days. Ingredients for this product are sterilized to ensure a healthy and bacteria free product. The package is designed in a nice gift box which will make this a great party favor or gifts for different occasions. 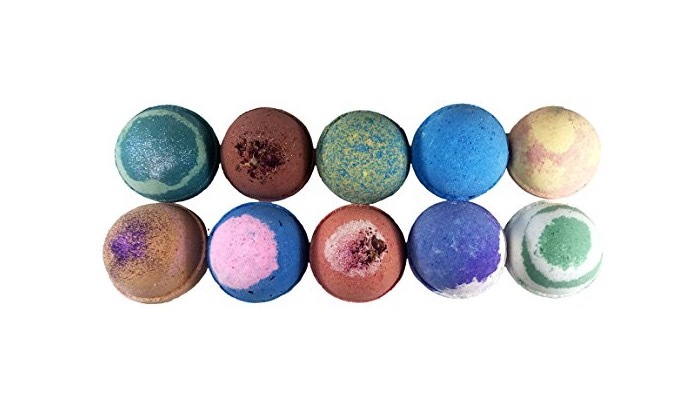 The Bath Bombs with Moisture Resistant Bag set is also a nice choice. These are large size bath bombs equal to a large tennis ball. They are made of fine premium materials. Each ball comes in an individually wrapped moisture resistant bag to keep it fresh. It also has a nice ribbon so this makes a great gift. These have infusions of toppings like flower buds, flower petals, glitter, and sea salt. They come in nice earth colors which are pleasing to the eyes. It’s a pack of 10 so the price is a great value for your money. 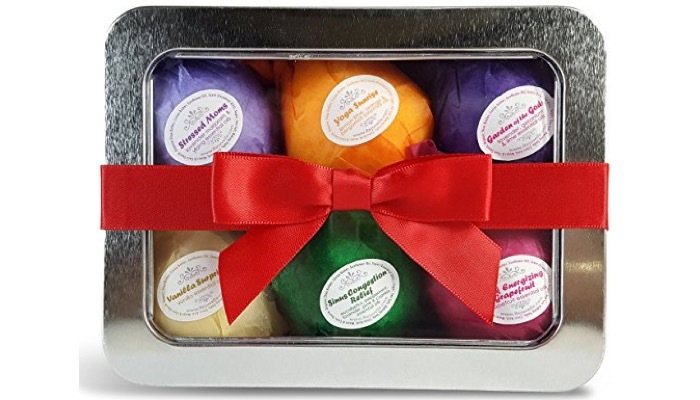 An affordable pick that does not sacrifice quality is the Mavogel Premium Bath Bombs Gift Set. This set has moisturizing benefits for your body. They soften your skin while immersing you in a soothing scents bath experience. The choices include purple vanilla, blue peppermint, red rose, yellow lemon, green tea, and white milk. This will leave your skin, supple, fresh and moisturized. They contain fine ingredients like mineral salts, baking soda, citric acid, essential oils and much more. It will be like having a spa treatment at home. There are different factors to consider when choosing a bath bomb or a bath bomb set. It depends on what your preferences are when it comes to ingredients and colors. Bath bombs are great mostly because they offer different types of scents. If you have some sensitivities or allergies, you need to check if the scents are mild and hypoallergenic. Some can be too harsh so choose ones that have natural scents. The unique thing about bath bombs compared to the regular bath gel is that they create fizz and swirling colors. Depending on your preferences, there will be a lot to choose from and most of all, make sure that when choosing strong colored ones, that they will not stain or tint your tub and skin. Spending time in the tub should be relaxing and fun so choose a bath bomb that has soothing properties. Ingredients like lavender and essential oils are great to make your bath time relaxing. Think about your skin as well when taking your most awaited bath. It will be great if the bath bomb has moisturizing properties so you don’t come out of the tub with dry and irritated skin. It has to leave your skin smooth and soft as well as hydrated. Bath bombs are also great gift items. So if you’re planning to give them away, take a look at the packaging. They will often have ribbons and nice boxes so you’re ready to give them.